The fast & efficient way to make homemade coleslaw! Cabbage Shredders were staples in homes across all ethnicities in order to make sauerkraut. Today the wooden Weston Cabbage Shredder is great for shredding cabbage or vegetables to make homemade coleslaws or sauerkraut. Simply place the cabbage in the wooden frame and slide it up and down while applying pressure to the cabbage. 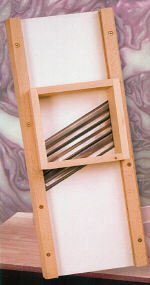 Measures 15.6 X 5.7 X 3"